Looking to bring a little curb appeal to the front of your home? Start with a color splash right at the front door. A door painted in your favorite shade will make visitors feel immediately welcome while giving you something to smile about every time you come home. From pink, to tangerine, emerald to yellow, we are sharing with you our favorite colorful doors to inspire your own festive front door transformation. 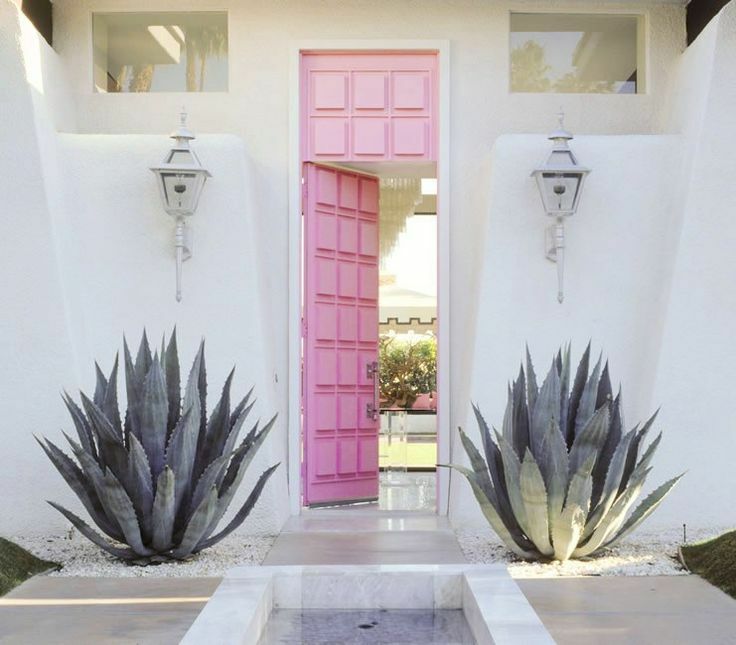 Create a sweet and colorful entry with a door in a pastel pink. Go vibrant with a door in a colorful and striking pattern. We love this one in fuchsia and black. What an amazing combination! Coral is one of our favorite shades, and it looks absolutely glamorous at the front of this mid-century modern home. Play with bright hues for a striking front door. Lacquered doors in tangerine or bright red are sure to make an impact. Create a color pop at the front of your home. This door in orange provides a warm welcome surrounded by an all-white exterior. Don't forget the trim! A bold door will look even more incredible when paired with a dark and unexpected trim, like the black trim on this front door. Paint the back of the door too, allowing a pop of color on both the interior and exterior of your home. We love how this front door brings a touch of green into the interior as well. Make all your neighbors envious with gorgeous green doors. And don't forget the hardware. Knobs in unique finishes will complete your stunning curb appeal. Yellow is a wonderful color for the front door. A strong, sunny shade will add a dramatic punch to your exterior. For a modern interior, why not a door with a modern color palette? Look for bold shades in neon for an unexpected color splash at the front of your home.